… a sign of the scale of the challenge they will face in unwinding unprecedented stimulus measures deployed over the past decade. Central banks’ bond-buying has helped push sovereign yields to record lows and in some cases into negative territory, with bondholders paying governments to own their paper. Okay, that just shows who is in charge – the currency-issuing government not the bond markets. Private bond dealers are being forced ” into a hunt for yield” by the central banks. The idea that the bond traders could force yields up is a myth, although you won’t find that mentioned in any mainstream macroeconomics textbook. Students are taught – relentlessly – or should I say indoctrinated to believe that when governments run fiscal deficits there is upward pressure on interest rates and bond yields as the finite supply of funds in the investment (loanable funds) markets are squeezed. We don’t observe that in the real world. So after reading the article you won’t be able to answer the question the journalists posed that policy makers are now in a difficult situation holding all those public (and private) assets on their books yet wanting to push up interest rates. The inference is that if the central banks reverse their transactions and start selling the bonds back into the secondary bond markets, the excess supply will drive down prices and push up yields. Then the government will run out of money, n’est ce pas? That sort of nonsense still takes up space in newspapers and other media on a more or less daily basis. Simple, select the numbers pertaining to these assets in the accounting system of each central bank and hit delete. Yes, that seems easy enough. All those government liabilities could be written off by the central banks holding them – without consequence. That is about all you need to know. The fact is that for many years now, central banks have been funding government deficit spending in a number of countries by creating liquidity – the very act that is meant to lead to an apocalypse of hyperinflation. At various times the hysteria propagated by the mainstream economics fraternity swings between fears about foreign ownership of government bonds to central banks going broke because their assets become worthless as governments default to central banks running out of control printing presses in sinister and dark basements that lead to people buying wheelbarrows to wheel their loose change from shopping around. We know that foreign purchases of, say, US government cannot be construed as funding the US government. If that government chooses it can keep spending with zero foreign government debt purchases. We know that there are no printing presses running mischieviously in basements. Just operators at computer terminals crediting and debiting relevant accounts. And we know that the massive buildup on the asset side of central bank accounts of government bonds has no implications for their solvency. Central banks can never go broke. I have been tracking this for a number of countries. Today, I update my US analysis given the Treasury and Federal Reserve has only recently provided new data. 5. 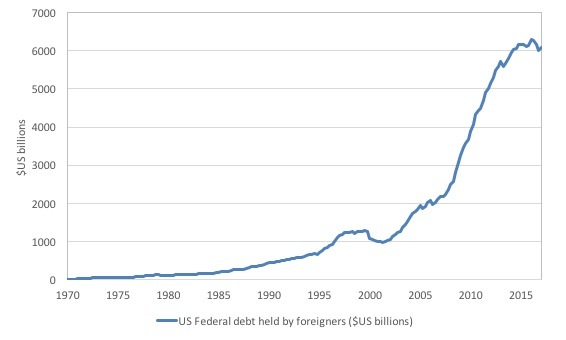 Foreign sales of US government debt are largely irrelevant. Now, to the most recent data – March-quarter 2017 – some 6 years later. Some of the data, by the way, is available for the June-quarter 2017, but only the complete set required for this analysis is available for the March-quarter. 1. Privately held – $US11,904.80 billion (60 per cent of total). 2. Federal Reserve and Intragovernmental holdings (SOMA and Intragovernmental Holdings) – $US7,941.10 billion (40 per cent of total). 3. Foreign and international – $US6,079 billion (30.6 per cent of total) – of which $US3,879.7 billion held by Foreign Official institutions (central banks etc). The government sector held about 40 per cent of its own debt in the September-quarter 2016. This is slightly down on the proportions held in the March-quarter 2011 (41.8 per cent). These holdings were either in the intergovernmental agencies (27.6 per cent) or the US Federal Reserve Bank (12.4 per cent). So the central bank has increased its holdings over the period in question and now holds $US2,464.4 billion and increase of 93.4 per cent in overall levels. The Chinese holdings were around 5.5 per cent of the total and hardly consistent with the rhetoric that China was bailing the US government out of bankruptcy. These holdings have fallen in recent years (see below). 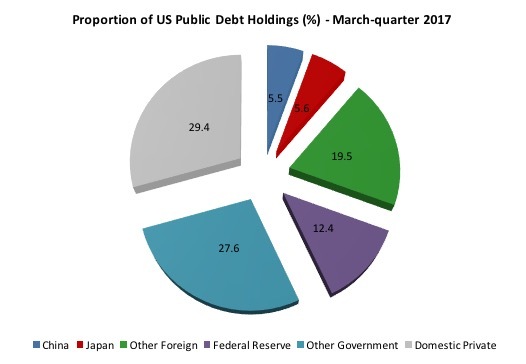 The three largest foreign US debt holders at the March-quarter 2017, were China (5.5 per cent); Japan (5.6 per cent) and Ireland (1.6 per cent). The impact of the British austerity is noticeable. In 2011, Britain was the third largest holder of US public debt (at 2.3 per cent of total US public debt). By March 2013, this had dropped to 0.95 per cent. They shed $US166 billion worth of US treasury securities in that 24 month period. As at the March-quarter 2017, the British share had risen again to 1.2 per cent of the total. Over the last year, the the US Federal Government has purchased 23.5 per cent of the new public debt issued, the US Federal Reserve has purchased 7.5 per cent and the private secotr has purchased 68.9 per cent. 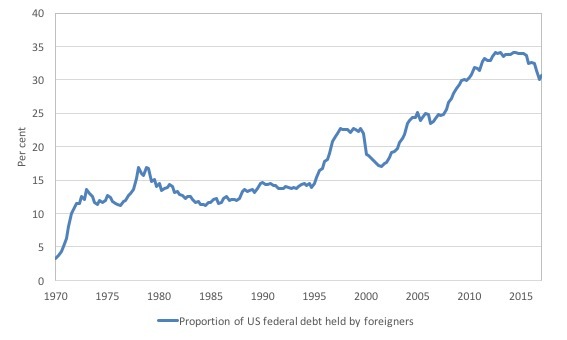 By way of comparison, in 2011, the increases in the US Federal Reserve’s holdings accounted for 54.7 per cent of the total increase in US federal government debt. That fell away to 4.3 per cent in 2012 and then rose again to 84.9 per cent in 2013. The proportion has been decreasing since then but has risen in the last year again. There is never a reason for US government bond yields to rise above a level that the government considers to be accpetable. 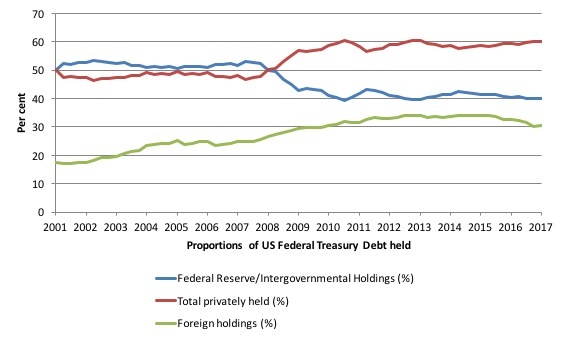 The next graph shows the evolution from the March-quarter 2001 to the March-quarter 2017 of the US public debt by private, public and foreign holdings (%). The foreign holdings are a subset of the private series. Here are some other observations that impact on how one interprets the Financial Times article. This sort of analysis shows that central banks have been funding government deficits in the US (and similar patterns exist elsewhere as the Financial Times article shows). The sky is still firmly above our heads. As a proponent of Modern Monetary Theory (MMT), I do not consider there to be a public debt problem so the analysis presented here is to document what has been happening. What it shows is that even within the voluntarily-constrained system that regulates the relationship between the US treasury and the central bank, the latter can still effectively buy as much US government debt as it likes. I would actually like the central bank to just debit and credit treasury bank accounts as required and for governments to dispense with the charade of issuing debt altogether. For those living around Sydney, Australia, I will be speaking on Thursday afternoon at a Workshop – Right2Work Sydney: Future of Work and Welfare – which has been organised by the Right2Work Coalition and Australian Unemployed Workers’ Union. The event will run from 14:00 and finish at 16:00. The location is at the Unions NSW offices, level 3, 4 – 10 Goulburn Street, Sydney, Australia 2000. I will be debating well-known sociologist Eva Cox, who considers a UBI to be the way forward. I will be discussing employment guarantees in that context. At time of writing 63 per cent has been raised with only 4 days left. Debts, money, all just markings on an accounting books. Central banks hold the books. Now what are we scared at, exactly? They are scared that if government is not revenue constrain, the only risk is inflation and inflation can be managed with taxes, the only issue left to discuss is how we distribute the economic output. For sure, this is a discussion that they don’t want to have. We? We are scared about the consequences of not having that discussion. Great post! A little side note, the section just before the conclusion is repeated twice word for word. Keep up the good work Bill! Bill, why do you keep saying that central banks are BUYING government debt, when they are actually SWAPPING government debt back into the “reserves” the government spent into existence previously. There is no net change in the net fiscal assets in the economy unless, the central bank buys a private sector (corporate) asset. In which case it would have to be funded by the currency issuing Treasury. I say “buying” because that is what they are doing. They are going into secondary asset markets and making purchases like anyone else who makes similar purchases. There is no need to hide from that. Clearly, there is no change in net financial assets in the non-government sector as a result, but that doesn’t negate the fact of the transaction. “Solution? Simple, select the numbers pertaining to these assets in the accounting system of each central bank and hit delete. Yes, that seems easy enough. All those government liabilities could be written off by the central banks holding them – without consequence. Yep. The continued denial, to themselves and to anyone who can actually think for themselves, that central banks are part of the government sector shows the extent of the havoc that the Groupthink virus has caused on the brain function of economics experts who even attempt to rationalise the absurd of accounting of QE to make it fit in with their core beliefs. It really is absurd. It’s rather important to focus on that point as opposed to what the transaction looks like. Because bank accounting is backwards, and that is used to confuse people. For example bank reserves are technically the commercial bank lending to the central bank. A point that is used by certain economists (who shall remain nameless) as propaganda to try and show how the commercial banks control everything and why we need ‘sovereign money’. In reality it is the power relationship that determines what happens not the fact that something is technically a loan. If I can force you to loan me money at a rate I determine, who is in charge? Government accounting is similarly bank accounting and backwards. There is no justification for the term ‘government debt’ for example, unless you similarly use the term ‘bank debt’ to describe any accounts that are in credit. Thanks Bill, I get your point. Meanwhile, I am trying to remember which of the MMTers used the term “the government always spends twice”. I think it was one of the UMKC profs. Meaning, that when the UK Treasury keyboards (spreadsheet transfer) my pension into my high street bank account, it simultaneously keyboards the equivalent amount, into my high street bank’s “reserve” account at the Bank of England. Hence, the liability imposed on my bank, is balanced by an equivalent asset. Balance sheet remains balanced. It makes it easier to explain the difference between a currency issuer and a currency user. Also, explaining how if I move my pension to another high street bank, the BoE will move the equivalent “reserve” to the new bank, to maintain balance sheet balance. Likewise, if I bought a government bond, the BoE would move the reserve to a Treasury securities account at the BoE; or, a cash account, if I took my pension out of an ATM. Actually, if equal protection under the law is to mean anything, the central bank should ONLY create fiat for its monetary sovereign – that or also distribute equal amounts to all citizens. And if we are to avoid welfare proportional to account balance, rather than need, then the debt of a monetary sovereign should yield AT MOST 0% and that would be for the longest maturity sovereign debt (e.g. 30 yr US Treasury Bonds); shorter maturities should yield even less (negative yield) with private sector account balances at the central bank (aka “reserves” in the case of banks) having the most negative interest. That said, individual citizens should have negative-interest-free accounts at the central bank up to, say, $250,000 per citizen. And then what need for government-provided deposit insurance and other privileges for depository institutions?